conventional instruments, or a previously active player who has become disabled. 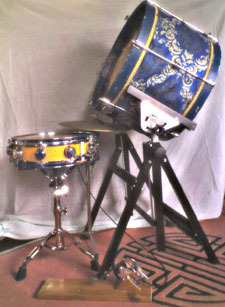 Or perhaps you're a drummer who is interested in alternative approaches to the drum kit. 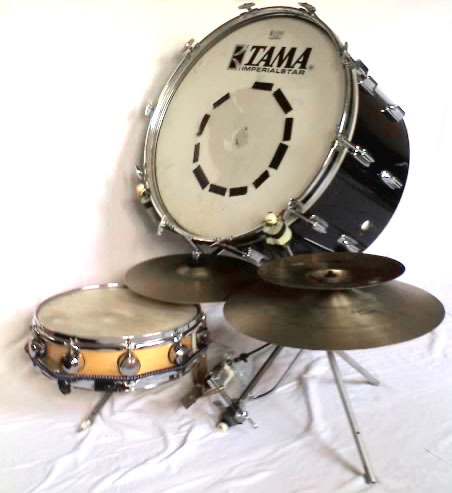 Non-standard ways of physically positioning of drums and cymbals (or electronic equivalents). 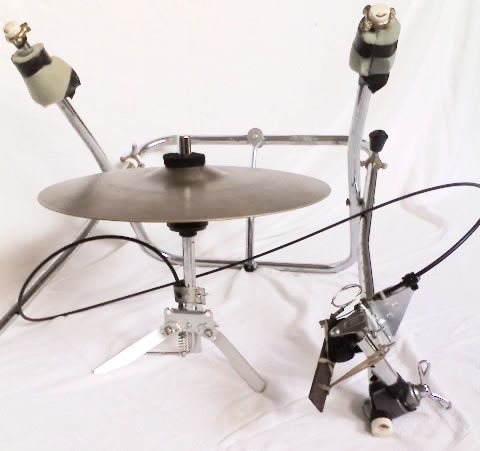 Different methods of striking drums and cymbals (or electronic equivalents). Alternative ways of operating cymbal sustain / choke mechanisms. Adapting standard commercially available equipment. I have developed a playing style that works without a foot operated kick drum, and without a foot operated hi hat, incorporating some of the ideas of linear drumming. I find the disadvantages of not being able to play 3 simultaneous beats on kick, snare and hi-hat are outweighed by the fact that playing the kick and snare by hand allows some otherwise impossible and spectacular patterns to be performed. 1. Re-positioning bass drum so it can be played with drumsticks rather than a foot pedal. 2. 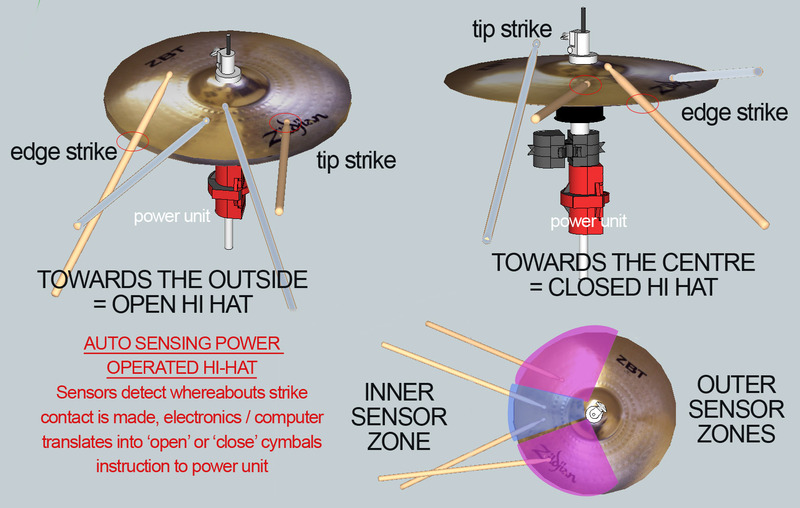 Employing mechanisms to operate the hi hat 'backwards' - i.e. 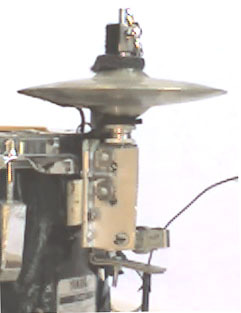 the cymbals are weight or spring-clamped closed, and the pedal or lever is used to open them. This is key as it saves keeping constant pressure on a pedal. I have used cable systems so that the hi-hat pedal can be relocated to where I can use it, as I play sitting on the floor cross legged. I also use electro-mechanical systems which nvolve adding a stepper motor to open and close the cymbals, and a variety of switches and a micro-controller to trigger and govern the action.for operation by hand, fingers, or any other suitable body part. (The switches are potentiometer type, to give a contiunous siganl rather than simple on/off). I am currently developing a system which will sense the position of drumsticks and operate the hi-hat accordngly - e.g. opening if played towards the outside of the cymbals, or closing if struck nearer the centre. 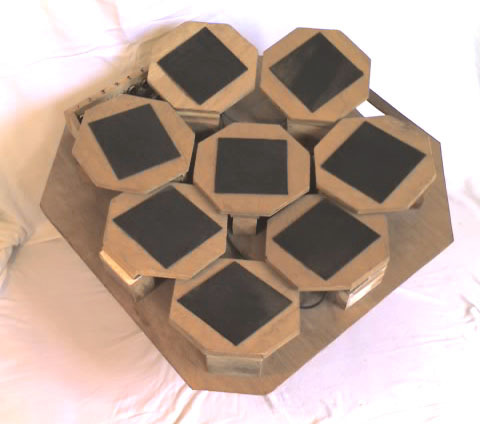 Building drum pads with custom designed layouts. Re-patching the set-up so that the bass drum sound can be triggered using drumsticks on a pad. Re-patching to provide one pad with an open hi-hat sound, and a separate pad with the closed sound, removing the need for an opening/closing mechanism. Amplified mesh heads allow much lighter sticks and playing style to be used. Prepared heads - the 'snare' has snares mounted above the head which are brought into action by striking the head at the appropriate point (rather than manually levering snares on and off). 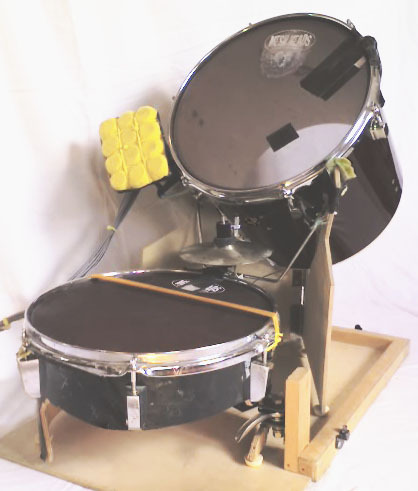 The 'kick' head is specially weighted to produce bass in the same way as a low tabla drum. The yellow block to the left of the kit is a set of trigger pads which are used to control loop recording and playback via MIDI messages. They may also control filters, fx and delays (Listen to Itskeri mp3). Loopers I have used include Lexicon and Gibson hardware and Mobius software - there are lots more around.